The American Public Health Association (APHA) opposes the confirmation of Judge Brett Kavanaugh to the U.S. Supreme Court. In a letter sent last week to the Senate Judiciary Committee, APHA executive director, Georges C. Benjamin, MD, expressed deep concern about Kavanaugh’s views and previous decisions related to public health. These include patient protections provided by the Affordable Care Act and the Clean Air Act, and protections needed to address gun violence and discrimination. 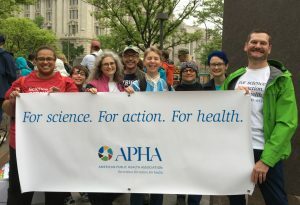 APHA members at the 2017 March for Science, Wash DC. The document doesn’t say Kavanaugh is horrible because of A, and he’s terrible because of B, C, and D. Instead, it lays out his judicial opinions on topics including the separation of powers, judicial precedent, Medicare, FDA, tobacco and environmental regulations, and workers’ rights. Readers can decide for themselves whether his legal views are threats to public health. Congress has assigned to the judiciary the task of reviewing agency regulations to ensure that agencies have properly interpreted the statutes that empower them and to ensure that their decisions are supported by substantial evidence and are not arbitrary and capricious. In the seminal case of Chevron, U.S.A. v. Natural Resources Defense Council, the Supreme Court set out a two-step test for judicial review of an agency’s interpretation of a statute. First, if the meaning of the statute is clear on its face, the court must confirm its clear meaning without deferring to the agency. If, however, the statute is ambiguous, the court should defer to the agency’s interpretation the statute if it is reasonable. Ever since the Court handed down that decision in 1984, some (mostly conservative) judges have chafed under its prescription for deference to agencies whose judgment they do not trust. Kavanaugh has been one of the most forceful judicial advocates of limiting the application of the Chevron prescription. The Senate Judiciary Committee has not yet scheduled a confirmation hearing on his nomination. The Committee announced on Monday they will be obtaining records from the National Archives covering the period in the 1990’s when Kavanaugh worked in the Executive Branch. I worry about the impact that Judge Kavanaugh will have on the Supreme Court because he is a favorite of The Heritage Foundation. This ultra-conservative organization has a laser focus on criticizing and opposing regulations and programs that advance public health. As an APHA member, I’m proud we’ve alerted Senators (and ergo the public) to our concerns about Judge Kavanaugh. Strong health, safety, labor, civil rights, and environmental regulations are vital to protecting individuals of all ages from injuries, illnesses, and premature death. Regulations are essential for advancing social justice, promoting general welfare, and securing fairness and prosperity.